We spent our first day in St. Albans mostly relaxing. We went with JP to the morning market where you can buy anything out on the street, from hardware and notions and shoes to artisan salami and breads and locally grown vegetables. Jim bought a black leather belt. Veronique bought a dress. JP bought vegetables. We drank coffee and tea and ate cakes (iced banana bread and a delicious, coarse-grained date-pecan-orange cake) in the sunny patio of a pretty café run by a former pro soccer player and his artist wife. JP went off to play hockey with his over-fifty team; Jim and I repaired to the front room to read and relax and work on the blog. After days of exploring, it was good to stay put for a few hours. 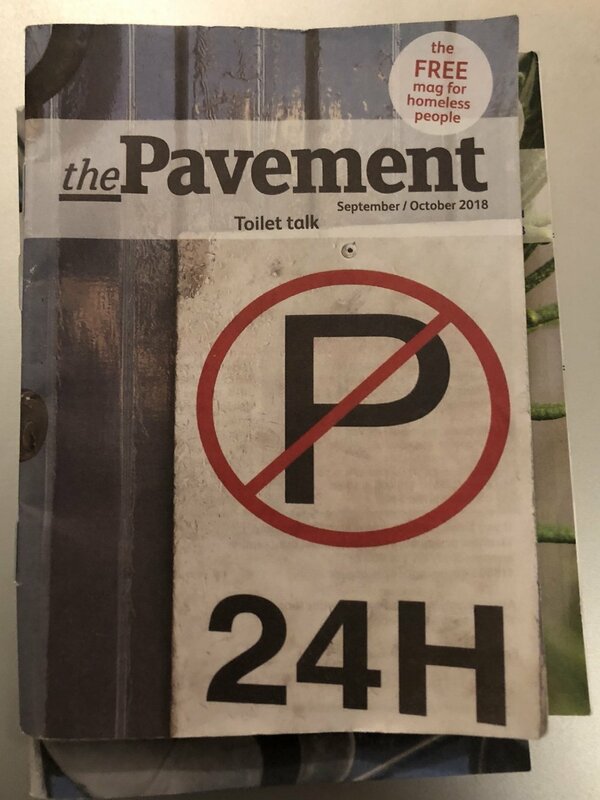 On this visit, Vero gave me copies of a small, pocket-sized magazine called “The Pavement,” which is by and for those who are homeless; the issues contain articles about the “sleeping rough” life and also many listings of available services. For a couple of years now, Veronique has been teaching classes in journalism to homeless men and women and ex-prisoners “so they have the tools to communicate effectively and tell their stories,” and “so they can identify issues that are important to them and cover them for The Pavement,” (which can be seen online here: http://www.thepavement.org.uk). JP returned home from his hockey game a little blue—his team lost, although he did score a goal. We went out for dinner at The Prae Wood Arms, a big rambling British country home now transformed to quite a good restaurant—though their sticky toffee pudding did not quite measure up to the first, more intense, dense, stickier, and now iconic version we fell in love with in London only two nights before. Also notable were the large and opulently appointed bathroom, though Jim and JP found the art in the Gents to be a bit sexist. Early Sunday afternoon was a long ramble in the countryside outside of St. Albans, where we flushed pheasants in the stubbled fields (bird hunting season would open on the morrow, poor creatures), admired various horses, and ultimately reached another literary landmark: what was left of a cottage where John Bunyan, (of The Pilgrim’s Progress published in 1678 and never since out of print or read in full), stayed when he preached in the area. The brick ruin sits spitting distance from the John Bunyan, an appealing country pub. As will happen more and more as we proceed on our journey, we wondered what the esteemed writer would have thought of such memorializing. On Monday morning, JP and Vero’s go-to driver, Mohammed, delivered us to the Luton airport where we were picking up our rental car. An immigrant from Pakistan, in a long beard and flowing kurta, he has been in England 50 years. When he heard that Jim and I had no children, he assured us, “There is still hope.” Abraham, he said, and Sarah were much older than we.